The cultural and architectural importance of the Merchant’s House is undisputed. 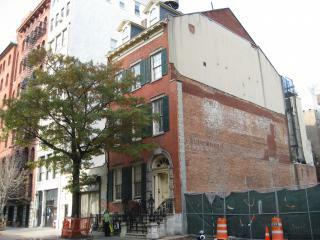 Built in 1832 and occupied by a merchant family for nearly 100 years, the House today is New York City’s only family home to have survived virtually intact, inside and out, from the 19th century. The Merchant’s House is a truly unique window through which to view the past. Considered one of the finest surviving examples of architecture from the period, the Merchant’s House has been recognized as a National Historic Landmark (one of only 2,400) and is listed on the National Register of Historic Places. In New York City, it has been awarded landmark status not only for its 1832 late-Federal brick exterior but also for its Greek revival interior rooms. Of note, the House was among the first 20 buildings designated in 1965 under the City’s new landmarks law. It is also listed on the National Register of Historic Places. It is the only historic house museum in the Greenwich Village/Soho/NoHo neighborhoods and celebrates 75 years as a museum in 2011. Following Gertrude Tredwell’s death in 1933 (she was born in the house in 1840), her cousin George Chapman turned the house into a museum commemorating the lifestyle of New York’s “Merchant Princes.” It opened to the public in 1936.